Simon Shack's (Tycho Brahe-inspired) geoaxial binary system. Discuss the book and website for the most accurate configuration of our solar system ever devised - which soundly puts to rest the geometrically impossible Copernican-Keplerian model. I have an idea now, after thinking a bit more about how the TYCHOS's parallax can be best measured. And it, of course, has to do with the notion of how to best test stellar parallax in general. 360 degrees / 365.22 days is approx. 0.9857 degrees. 86400 seconds per day / 365.22 days is about 236.57 seconds. 24,900 miles / 365.22 days is about 68.178 miles. Every 24 hours, our "midnight" moves by about 0.9857 degrees or 3.94 minutes of our day or 68 miles away on the equator. Well, let's just use 4 minutes and 110 km (roughly 68 miles). To expand on this thinking, let us expand the scope of our experiment and achieve the most "night" we can reasonably expect to get ideal viewing conditions. 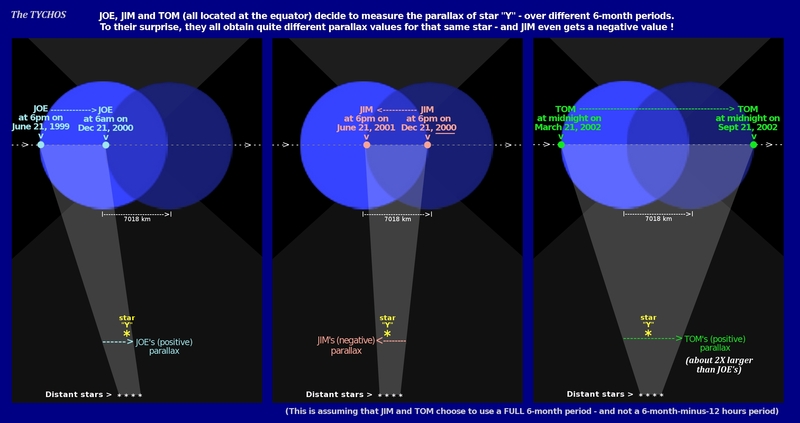 Consider about 4 months, or about 1/3 of a year, and we should expect to see a much greater difference in stellar parallax compared with minute measurements of a single week. Still focusing on the solstice, but this time let us move to the "outer" parallax visible during the Northern hemisphere's "Winter" which from Ecuador's midnight will be roughly in the direction of star Procyon. So in order to face a reasonably precise parallel direction each night (we must take into account the PVP) we might say that we can take great parallax measurements at times that move our measurement time by about 3.94 minutes away from midnight in each direction. On the equator with the winter solstice being our "focal midnight", without having to move our work station, these times calculate to be good enough for comparison. Please note that I have selected a few clusters of consecutive days so that we can maximize observations under different conditions. (Ecuador during rainy season would be problematic but the same experimental parameters apply to anywhere in the world that gets a good dark and clear Winter period). Critical extreme A — risks light pollution at such a time close to dawn but let's assume this could still provide some great star visibility. A whopping 5,000 km (and a little extra) on Earth's journey to test stellar parallax! What do you think? Can we write a grant for this project so that we can just get a decent telescope and start this great experiment come October? If the experiment were conducted in the same way for several years in a row, of course, you would gain that much more parallax to compare. The point of designing this experiment to not have to move our "eye"/camera is to make precision "easy" (as opposed to rotating our view with the Earth's rotation). We might call the former experiment, designed above, as the "pseudo-parallel frame of reference technique". (Pseudo-parallel because the Earth is actually making a slow curve through space, not a straight ray). We might design another one which I will describe below, as the "rotating frame of reference technique". This will produce a more instant and greater parallax but must be recorded through more atmosphere and therefore risks greater distortion. As you can see, since we are on the equator, we should only have to rotate directly along Earth's ecliptic. About 11,788.7 km (+14.4 km) = 11,803.1 km of opportunity for parallax! (In a single 9-hour span giving us over twice what is achieved across 4 months). (This is using an estimated radius of 6380 km for Earth). We could even set up a camera to track that area of space and record the entire time. But, unfortunately, while this technique does produce much more parallax it also means peering through much more atmosphere and therefore more distortion of star positions. It also means we need to calculate as precisely as possible the two times that we will be equidistant from the stars (as Earth rotates our telescope is carried closer to the "outside" of Earth's circumference closest to the stars, then back again in the circular motion of Earth's rotation on itself.) There may be some distortion with all the parabolic movement towards and then away from our target stars if video were taken instead of just snapshots to exactly equivalent East and West views. Parallax becomes more noticeable and easier to measure when there is a close object and a far away one. The projection points of the Moon, Sun and planets are listed in astronomical tables and used for celestial navigation. Why not measure the parallax between for example the Moon and distant stars at various times and use that data to get correct triangulation calculations. Another idea is to design a device along the same principle as a range finder but using a significant distance on earth to get measurable angles. Nice. Let's try doing that at the next opportunity. We are something like a third way around the globe from one another. We can try to use the same timing web site as well as official atomic clock computer time at the same time while we remain in live digital contact to confirm timing of a photograph series. Being this far away we should be able to look in opposite directions in the sky and compare similar objects. It would be even better if I were in Northern California and you were in Rome area with Simon because those are close to the same latitude. For us to both have night, you'd have to get up early in the morning though. Would that be okay with you? Well I don't have a decent camera and my mind is at Tychosium right now. I'm working to get the correctness of T2d transferred to T3d and the new time system. That will be the main feature of version 1.0. Plus all the stuff that's already in place of course. But when 1.0 is out the door I will start working on a nicer trace, put in some stars, a celestial sphere etc. But I hope other Cluesforumers catch on and find ways to take part in this historical ongoing research that Simon has ignited. And I am glad you think my ideas are sound Hoi. Since Astronomy has been distorted by religion for several hundred years, it has ritual ways of doing things, like measuring star distances and parallax, that may not be the most practical and pragmatic way to do it. As Simon points out so many times in his book, parallax is of course much greater between a close and far away object, than two distant ones like stars. So why can't a close object like the Moon be used when measuring parallax, provided we know where it is in relation to Earth at a certain point in time, and that we indeed know since that is crucial knowledge when doing celestial navigation. And as Simon also points out - If the Earth is supposed to move 2.5 MILLION kilometers per day on its way around the Sun, then how by Jove, can there be almost no parallax between the Sun and the stars showing this! No wonder the old astronomers figured the Earth was motionless. That makes much more sense than this. Thanks Hoi and Patrix for your thoughts and suggestions about how we may - some fine day in the future - verify the TYCHOS model paradigm via stellar parallax measurements. Having now looked further into this subject, I dare say that such an enterprise should indeed confirm my proposed PVP orbit of Earth. 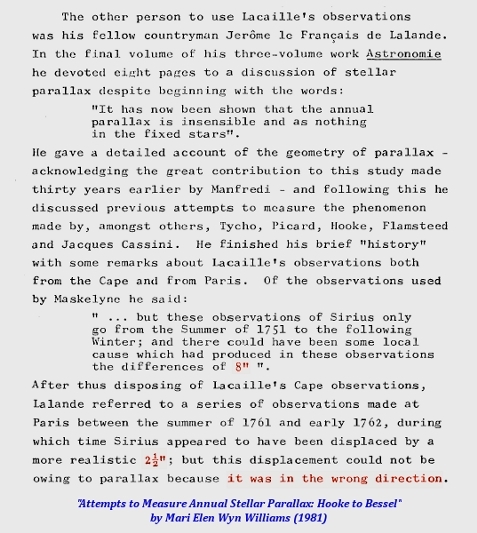 The thesis narrates in great detail how the most eminent astronomers of the 17th / 18th / 19th century desperately attempted to measure stellar parallax - and makes for a most riveting (and oft hilarious) read. The section I wish to highlight here recounts how our brightest star in the sky, Sirius, was chosen as an ideal 'test bed' - for a number of reasons which you may wish to read for yourself (by downloading the PDF that I have saved and linked to above). To make a long story (very) short, the parallax of Sirius was once observed / recorded [by the most eminent astronomers of the time] to be 8"(arc seconds). Yet, on another occasion, it was observed to be no more than 2.5" - and in the wrong direction ! Take note that "OBSERVATION 2" (as I shall call it) yielded a parallax for Sirius that was only 31.25% of the size of "OBSERVATION 1" (2.5 being 31.25% of 8). On top of that, it was "in the wrong direction!"... Of course, all of our world's greatest astronomers were roundly baffled at such enormous & inexplicable discrepancies between these two successive parallax values obtained by some of the very best observatories of their times. At this point you need to know that Sirius has an annual, lateral PROPER MOTION of -0.546" (arc seconds) of RA (Right Ascension). The minus sign means that Sirius is observed to move "backwards" - or "Eastwards" - against the background stars. ( Sirius also moves / declines "downwards" - or "Southwards" - but this is of no bearing to our present discourse which only deals with lateral displacement). Please note that the so-called PROPER MOTION of a star is something that gets determined over several decades of observations - and is therefore a pretty firm & reliable type of observational record). Yes, every star in our skies has its own peculiar PROPER MOTION (in ANY direction) - and therein lies the main difficulty of determining the actual parallax of each one of them. 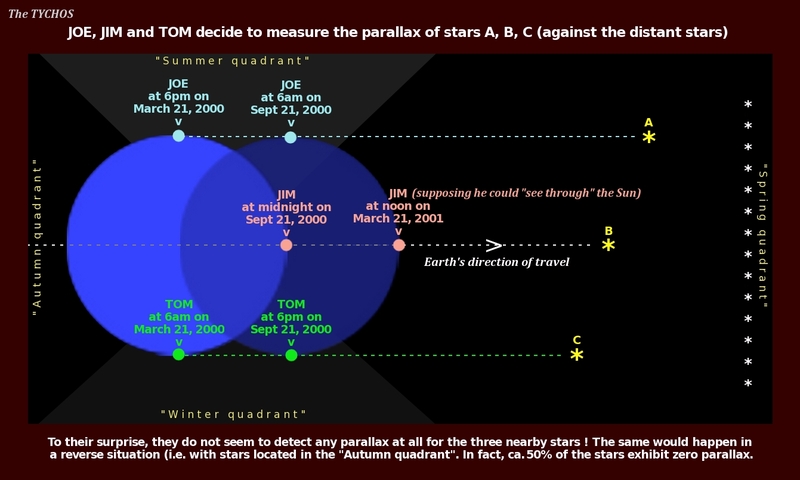 However complex this graphic is, its purpose is just to show how measuring a given star's parallax is entirely dependent on the time-window chosen to perform any such measurement. Observations of any given star may yield "positive" or " negative" results - and this is precisely what we may find (in astronomy literature): a great many controversies involving huge discrepancies between the parallax values gathered by our world's top astronomers - some of those values being (as mentioned in Mrs Williams' thesis) "in the wrong direction". In other words: "negative" parallax values. I am currently taking a closer look at this subject - and will soon post about some most interesting astronomical debates of yesteryear which, it appears, have been 'buried under the sand' . Barnard's star is famed for being the fastest-moving star in our skies : as seen from the Northern Hemisphere, it appears to ascend ("Northwards") by as much as 10" (arcseconds) every year. It also drifts 'laterally' by about -0.8" of RA (Right Ascension) each year. In earthbound visual terms, this means that it is observed (from the Northern Hemisphere) to move quite swiftly "upwards" and (much less heftily) "from left to right" - i.e. from East to West against the background stars. 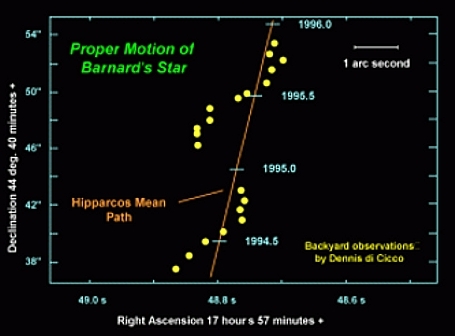 An amateur astronomer, Dennis Di Cicco, is known for having plotted the Barnard's star "parallax" (or more correctly speaking, its PROPER MOTION). As we shall see, this zigzag motion of the Barnard's star (recorded by DeCicco) has very little to do - if at all - with "parallax". Here's a graphic of mine featured in my TYCHOS book titled "A MAN'S YEARLY PATH". It shows the trajectory that any given point on Earth (or building, or immobile person) will trace during the course of a year - under the TYCHOS model's paradigm : to fully understand it, you may imagine this trochoidal loop as the path that would be traced (in a time-lapse video sequence) by, say, the Big Ben in London - if you should hover above our North Pole and snap a picture of it every night at midnight for a full year. In contrast, Barnard's star is located at a mere +04°41 from the ecliptic (as viewed from the Northern Hemisphere). Its path will therefore not exhibit a trochoidal path over the years - but a "sinusoidal" one. Obviously, the star does not truly / physically zigzag in such way across space - nor can this be some sort of parallax effect. So what is it? The lateral drift of an earthly observer will actually "decelerate" and "accelerate" in relation to the stars (or our own system's planets) - in the course of a year. Kepler had it the other way round: he said it was the planets that "accelerated" and "decelerated" in the course of a year. It is up for everyone to judge for themselves which of these two assumptions is the more likely one. As expounded and illustrated in this post of mine, there simply cannot be any "negative" parallax under the Copernican model's geometry : it would be a physical impossibility, since (if Earth were revolving around the Sun) all the visible stars would be - at all times - located 'to our right', i.e. around the "outer side" of Earth's orbit. Conversely, the TYCHOS predicts that the observed stellar parallaxes should be distributed much like they are, in fact, listed in our modern star catalogues. That is: 25% positive, 25% negative and 50% zero (i.e. not showing any measurable parallax at all). It is important to understand that (as explained here), in the TYCHOS model, stellar parallaxes can be either positive or negative - or zero - depending on whatever period / time-window is chosen to perform any such measurements. In spite of "negative" parallax being exhibited by about 1/4th of our stars, this whole topic seems to be - incredibly enough - practically absent (i.e. shunned / undebated) in modern astronomy literature. This is in stark contrast with older astronomy literature (of the 17th and up to the 20th century) where one can find numerous mentions and heated debates about the vexing question of negative stellar parallax. I will hereby quote a few (extracts of) old writings which I have come across - in order to highlight this fact, and to substantiate my growing suspicion that some sort of 'concerted efforts' may ultimately have been deployed in order to, so to speak, "sweep the vexing question of negative stellar parallax under the rug". "[Bessel] is credited with being the first to use parallax in calculating the distance to a star. Astronomers had believed for some time that parallax would provide the first accurate measurement of interstellar distances — in fact, in the 1830s there was a fierce competition between astronomers to be the first to measure a stellar parallax accurately. In 1838 Bessel won the race, announcing that 61 Cygni had a parallax of 0.314 arcseconds." 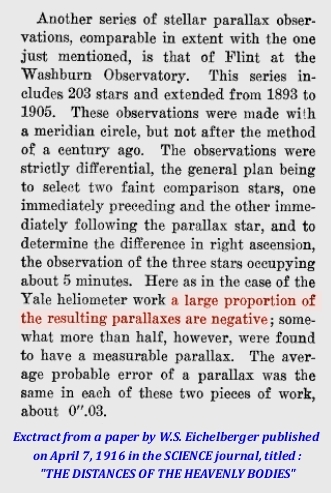 I must say that I find it quite ironic that the very first stellar parallax ever observed in astronomical history was ... negative! "But Bessel was to be disappointed again: when he had finished the reduction of the position of 61 Cygni relative to the six different stars he was forced to the conclusion that its parallax was negative! The paper in which this result was announced took the form of a report only, with no explanation of why a negative answer might have been obtained." Now, before proceeding any further (and before the reader gets awfully confused), I wish to make it very clear that the entire history of stellar motion measurements reads like an almost kafkaesque novel of utter & dire, tragicomical confusion. Since virtually ALL of the most acclaimed astronomers of yesteryear were firmly convinced of the heliocentric Copernican model, they simply had no chance to make any sense of their own, different stellar observations and measurements. As they compared & cross-checked the data of their various observations of relatively nearby stars (all performed during different annual time periods), they couldn't even agree on the actual DIRECTION of any given star's proper motion! (A star's "proper motion" simply refers to its own peculiar, independent motion / displacement in space - in any given direction). "For, in many cases, some of the greatest names have differed even as to the direction of the motion of particular stars : one making it positive whilst in the same star another considers it as negative." In other words, two of the greatest astronomers of the times totally disagreed about the motions of 10 well-known & important stars in our skies, one claiming they were moving in one direction, while the other claiming they were moving in the diametrically-opposed direction ! This was certainly no matter of minor relevance - yet such astounding and inexplicable inconsistencies were (already back then) relegated to mere footnotes. Understandably so, I might add, since they had no frigging clue as to why on Earth negative parallaxes were consistently being observed. So the question becomes: if our world's most eminent astronomers cannot even agree on the DIRECTIONS of the stars' proper motions, what are we to make of the - far smaller - annual amounts of stellar parallax (whether 'positive' or 'negative') published in their star catalogues? 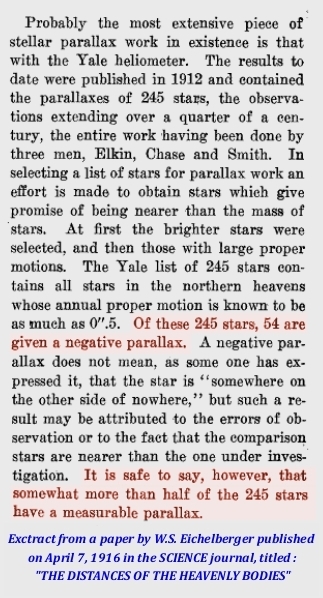 More importantly still, has our scientific community ever explained the very existence of "negative" stellar parallax? The plain answer to this is: no. But let us get on - and take a look at some other historical, scientific papers concerned with annual stellar parallax. So let's see: if only "somewhat more than half" of those 245 had a measurable parallax, this means that somewhat less than one half (shall we say about 120?) had UNmeasurable (i.e. "zero") parallax. Of the other "more than half" (shall we say, 125? ), as many as 54 had negative parallax. Well, this all seems to support the notion that the stellar parallaxes are roughly distributed in a 25%(positive), 25% (negative) and 50% (zero) fashion - just as predicted by the TYCHOS model. 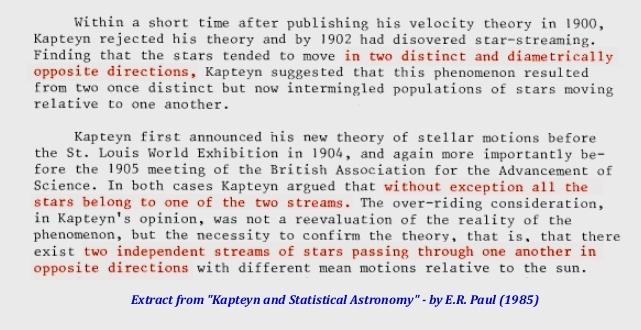 "KAPTEYN'S UNIVERSE" - and its subsequent "destruction"
We shall now see how Jacobus Cornelius Kapteyn (probably the most eminent authority in matters of stellar motions of the 20th century) interpreted the "vexing" issue of negative parallax. 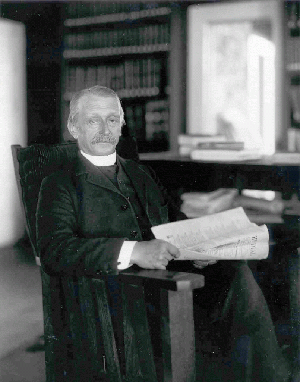 From the Encyclopaedia Britannica: "Jacobus Cornelius Kapteyn, (born Jan. 19, 1851, Barneveld, Neth.—died June 18, 1922, Amsterdam), Dutch astronomer who used photography and statistical methods in determining the motions and distribution of stars." 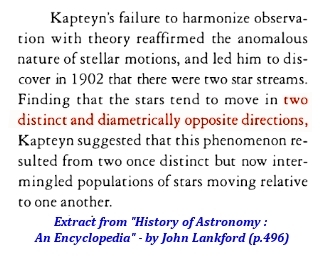 That's right: Kapteyn found that the stars tend to move in two distinct and diametrically opposed directions. He called this phenomenon "star-streaming". It appears that his theory was promptly mocked by the "upper" scientific establishment - who sarcastically called it "Kapteyn's Universe". Now, please understand that I'm not taking sides with Kapteyn's "star-streaming" theory (since my TYCHOS model has a much simpler explanation for the co-existence of positive, negative and "null" stellar parallaxes). What I now wish to share with you, dear reader, is the story of how "Kapteyn's Universe" was ultimately destroyed - by a most dubious personnage by the name of Harlow Shapley. Harlow Shapley (November 2, 1885 – October 20, 1972) was a 20th-century American scientist, head of the Harvard College Observatory (1921–1952), and political activist during the latter New Deal and Fair Deal. He used RR Lyrae stars to correctly estimate the size of the Milky Way Galaxy and the Sun's position within it by using parallax. Shapley was born on a farm in Nashville, Missouri, to Willis and Sarah (née Stowell) Shapley, and dropped out of school with only the equivalent of a fifth-grade education. After studying at home and covering crime stories as a newspaper reporter, Shapley returned to complete a six-year high school program in only two years, graduating as class valedictorian. In 1907, Shapley went to study journalism at the University of Missouri. When he learned that the opening of the School of Journalism had been postponed for a year, he decided to study the first subject he came across in the course directory. Rejecting Archaeology, which Shapley later explained he couldn't pronounce, he chose the next subject, Astronomy." Caption: "Members of the Independent Voters Committee of the Arts and Sciences for Roosevelt visit FDR at the White House (October 1944). From left: Van Wyck Brooks, Hannah Dorner, Jo Davidson, Jan Kiepura, Joseph Cotten, Dorothy Gish, Dr. Harlow Shapley"
...the words of a raving psychopath? After which, the vexing question of negative stellar parallaxes appears to have been definitively swept under the rug. Great "job", Mr Shapley! "Of course?" Well, so both Bradley and Bessel (two among the most illustrious observational astronomers of all times) had "fallen foul" to that pesky negative stellar parallax 'incovenience'. We then have the curious case of Wilhelm Struve (Bessel's N°1 'rival' in the decades-long quest for the elusive stellar parallaxes - both were equipped with the most advanced and exacting apparel of the times, the Fraunhofer telescope). 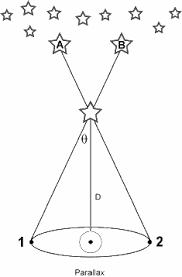 Struve had in fact preceded Bessel's day of glory, announcing (in 1837) that he had found a parallax for star Vega (of 0.125"). 1 - They often "bumped into" the pesky issue of negative parallaxes - yet curtly dismissed them as being ["as a matter of course"] 'observational errors'. 2 - Struve (yet many other similar cases can be found) first reported a parallax for a star (0.125") which then was 'corrected' to 0.2619", i.e. about 2X as much! So let's see: we can only speculate, of course, but perhaps we may draw some reasonable hypotheses as to how those recurring "errors" came about. It goes without saying that the aforementioned astronomers were all staunch supporters of the Copernican model - having long adopted it as an unquestionable reality of our cosmic geometry. Any "errors" that contradicted their preconceived convictions were swiftly brushed away. As we now look at these old parallax debates through the "TYCHOS lens", we may possibly make some sense of them all. To follow my reasoning (and graphics), the reader must have a basic 'visual' understanding of my TYCHOS model - and its geometric layout. What we first need to ask ourselves is: did those astronomers of yesteryear always measure stellar parallaxes over a full 6-month period - or over a 6-month-minus-12-hours period? (the latter is what is said to be the correct way, today). It would stand to reason that they would have chosen a FULL 6-month period, due to their exacting standards: after all, if Earth speeds around the Sun at 107.226 km/h, it would cover as much as 1,286,712km in 12 hours! Such a vast distance would not have escaped the attention of our 18th/19th-century astronomers - as they minutiously assessed the time periods in which they were to observe any stellar parallax. Thus, we may sense how many "errors" of the past may plausibly be explained by the TYCHOS model's geometric configuration (and Earth's 1-mph "snail pace"). Yet, they haven't been able to detect ANY parallax for about 50% of our (relatively) nearby stars? Quite frankly, I think that the TYCHOS model provides a far better explanation for all of these "space oddities". Fantastic job Simon... a welcome addition to the TYCHOS material. I had been looking up about Harlow Shapley independently... very shady fellow for sure. Also there seems to be another connection with the "great debate" (which is called that after it happened, and hardly anyone knew about it). There seem to be a small bunch of folks who ushered in the very very large universe of modern astronomy: Hale, Hubble, Shapley and Curtis. Table 1 presents some aspects of the lives and works of the four people most closely associated with the 1920 debate: Hale who suggested it, Shapley and Curtis who carried it out, and Edwin Hubble who, a few years later, collected the data that settled the issue of island universes. All were born in the midwest, within 21 years of each other, and all had doctorates of some sort, though Hale's were all honorary. I mention their activities during WWI because at least part of the source of the life-long coolness between Hubble and Shapley was that Shapley, remaining at Mt. Wilson, carried out some project that Hubble had intended to pursue as soon as he could take up his profered position there after returning from active duty overseas (Hoffleit 1995). Hubble had volunteered immediately after defending his thesis and apologizing to Hale for not being able to accept the Mt. Wilson position immediately. AND Hubble was a Rhodes Scholar... all of which makes it a very suspicious bunch. I wonder if anyone else has bumped into this? The incredible thing about Edwin Hubble is that "Big Bang" theorists have somehow seized upon his work to back up their 'constantly-expanding-universe' claims. This, in spite of the fact that Hubble himself stated that his observations did NOT suggest that our universe is continuously expanding - i.e. that the higher redshift detected in (ever-more-distant) galaxies does NOT equate to ever-faster recession rates of the same! [recession = the supposed motion of galaxies drifting AWAY from our solar system]. More likely (according to many eminent "dissenters" - who seem to have been 'silenced' by academia in later decades), our universe is static and stable. Larger redshift is only an indication that a galaxy is farther away from us - and not an indication that it is moving away from us at a higher rate of speed. Abstract "Almost all astronomers now believe that the Hubble recession law was directly inferred from astronomical observations. It turns out that this common belief is completely false." "One approach is to use a simple deductive argument with only one basic premise. This premise states that the universe is static and stable. Here static means that the whole universe is undergoing no large-scale expansion or contraction." "The past eight decades of astronomical observations do not necessarily support the idea of an expanding universe. This statement is the final answer to the question asked in Sect. 1 of the present study. Reber (1982) made the interesting point that Edwin Hubble was not a promoter of the expanding universe idea. Some personal communications from Hubble reveal that he thought a model universe based upon the tired-light hypothesis is more simple and less irrational than a model universe based upon an expanding space-time geometry." "The Rhodes Scholarship, named after the Anglo-South African mining magnate and politician Cecil John Rhodes, is an international postgraduate award for students to study at the University of Oxford. It is widely considered to be one of the world's most prestigious scholarships." Phew. Well, one could rightly say that Cecil Rhodes was a "British Hitler" of sorts, what with his anglo-saxon supremacist "race"(!) convictions. It thus follows that Oxford University, which has evidently never repudiated this madman's legacy, is a rogue anglo-supremacist, "Nazi-like" institution. Thus, one has to wonder what exactly Edwin Hubble (one of the first Rhodes Scholarship fellows) was up to. Perhaps he became a dissenter in later life, and that's why he was never given a Nobel Prize - and why there exists no "Edwin Hubble burial site" to visit? What? No funeral and no burial site for the man hailed as the greatest / most influential astronomer of our modern age? Very strange. "In the 21st century it is high time that independent thinkers break all ties to academia and begin forming our own parallel system of scientific development and achievement." I am mirroring this fine paper by Anthony Migchels here - lest it 'inexplicably' disappears from the web (as other similarly interesting articles have, in later years). Heliocentrism, the long standing belief that the Earth revolves around the Sun, is dead. The key evidence for it, stellar parallax, does not exist. The implications of this stunning fact are enormous. Not only does this end Heliocentrism as a viable system, it also ends our ideas about the distance of the stars. Tycho Brahe has been right all this time. The Sun revolves around the Earth and the Earth is the center of the Universe. Do you not believe me? I don’t blame you. The implications are enormous. But allow me to explain what is going on. Throughout antiquity and the Medieval era, Geocentrism had been the norm. Ptolemy was the great sage of this idea and his system, which claimed that all celestial bodies circle the Earth, was generally accepted as the standard. However, already in antiquity, astronomers were starting to have doubts, as they were suspecting the Planets, Mercury and Venus in particular, were circling the Sun. By the time of the late Middle Ages, it was becoming clear that the Planets were indeed circling the Sun and that the Ptolemaic system needed a serious update to accommodate this. Then Copernicus published his famous ‘Revolutionibus’ in 1543, describing the orbit of the Planets around the Sun. However, Copernicus did a whole lot more than just that: he also put the Earth in an orbit around the Sun. And this was a wild leap of the imagination, which was absolutely not warranted with the available evidence. In the first place, astronomy had always seen the Planets as simply wandering stars, luminescent spheres on the firmament, only different from the other stars because they were moving, unlike the others. To suddenly claim the Earth was just another Planet was not at all uncontroversial, and it still isn’t. 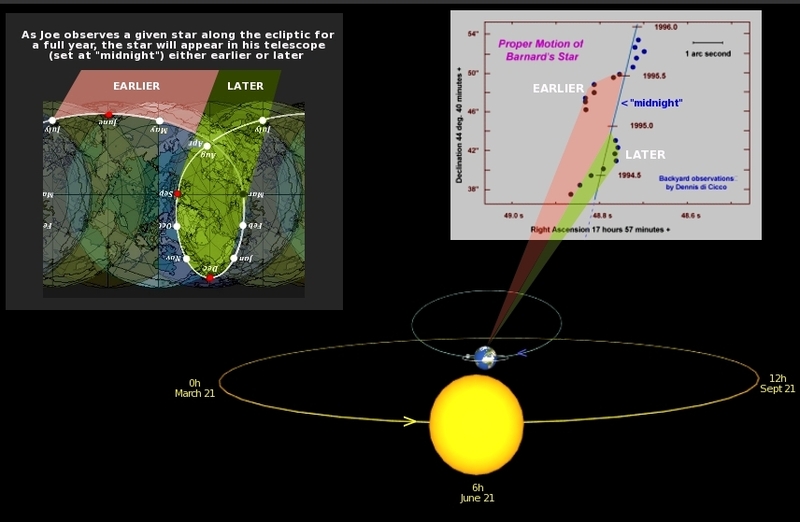 Secondly, we should be witnessing stellar parallax when the Earth circles the Sun. If the Earth is orbiting the Sun, then this should show in relative movements of closer and further away stars. Parallax is what we see when we drive by a landscape and closer by objects seem to be moving more quickly than those further off. Stellar parallax, then, should result from the movements of the Earth. Closer stars should show relative motion compared to further away stars. And this was simply not being observed at the time. However, Copernicus and his followers explained this away by saying that the Stars were simply too far away for the effect to be observed. It is for these reasons that Tycho Brahe published his ‘An Introduction to the New Astronomy’ in 1588, proposing a Geocentric, Neo-Ptolemaic system, where the Sun revolves around the Earth and the Planets around the Sun. The Tychonic system is simpler than the Copernican one and definitely fitted the observable evidence of the time better than Heliocentrism. It still does today. By explaining away the lack of stellar parallax, Copernicus was in fact not in accordance with Occam’s razor, which claims that the simplest solution is usually best. However, the Tychonic and Copernican Systems would compete with each other for centuries. The reason for this is mainly that, for some mysterious reason of their own, Kepler, Galileo and Newton, would all three support Heliocentrism. As a result, their fame based on their own achievements, would rub off on Heliocentrist credibility. And this was not warranted, because Kepler’s elliptical orbits, Galileo’s observations of Jupiter’s moons and Newton’s laws of gravity, fit equally well with the Tychonic as the Copernican system! This point is really very vital to understand the history of the Heliocentric deception. Then in 1838 something remarkable happened: Friedrich Bessel for the first time observed star movement. Shortly thereafter a number of stars were observed moving on the firmament relatively to other stars. This in itself was an interesting achievement, a testament to improving telescopes. However, Bessel and his contemporaries quickly jumped to the conclusion that this must be the stellar parallax that they had been looking for ever since Copernicus, no less than three centuries. But this was most likely a premature conclusion. After all: parallax is the seeming movement of closer by stars relatively to further away ones as the result of the Earth orbiting the Sun. The fact is that the star movements that Bessel and colleagues observed, might have been caused by other reasons. However, by the authority of their great predecessors, astronomers and physicists were heavily invested in Heliocentrism, even though the Tychonic system was, by all available evidence, still the preferable system. As a result, Bessel’s observations were quickly jumped upon as having finally settled the issue and everybody rested assured Heliocentrism was a fact. This led to some horrible disasters later on, most notably the Michelson-Morley catastrophy, culminating in the mystique of ‘relativity’ and a wasted century for astronomy. We’ll come back to that later. Meanwhile, ‘stellar parallax’ was considered a given and ever since mainly a proud member of science’s hall of fame. However, since these days astronomers have been faithfully logging the movements on the firmament of hundreds of thousands of stars. And now comes the great kicker: it transpires that about half of the logged stars show ‘parallax’ (or at any rate, movement). But about half of each move in opposite directions! This is called positive and negative stellar parallax. 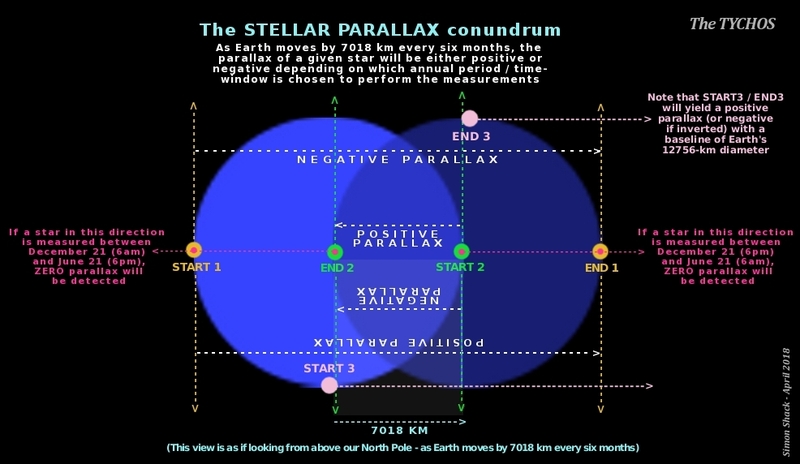 However: if we are indeed witnessing stellar parallax as a result of the Earth’s orbit around the sun, all parallax should be in the same direction! As a result we must conclude that the movement of the stars that we have been measuring ever since Bessel does NOT validate Copernican Heliocentrism, but IS consistent with Brahe’s System. Furthermore, we cannot call these stars’ movements parallax at all. Because if these movements were caused by moves in the firmament, a result of the stars spinning around the Earth, or vice versa, all movement should still be in the same direction. We must conclude that the movement that we are seeing is caused by other factors, and cannot be called stellar parallax at all. And this also means that all our calculations of the distance of the stars are rubbish too. And this brings us full circle, because it was Copernicus himself who began the insane blowing up of the Universe, based on nothing but speculation. We have been had. On a scale that is truly hard to fathom. The scientific community is guilty of covering up an immense scandal: that hundreds of thousands of confirmed star movements refute stellar parallax and therefore Copernican Heliocentrism. Nobody dares touch this stuff, while it sits there sticking out like a very sore thumb indeed. This is far from the only example of a huge cover up. The fact is that our entire ‘science’ based world view is a fraud of truly monumental proportions. Here is another example before we close off. While Earthbound observation of the Sun can probably never conclusively show whether the Sun circles the Earth or vice versa, NASA should theoretically be able to do just that. Presumably, they are scouting the solar system as we speak and it should be a piece of cake to have one of their satellites monitor the Sun’s orbit (or the Earth’s). They would only need a few months worth of data to prove the point. Why, do you reckon, has this not happened? "We must conclude that the movement that we are seeing is caused by other factors, and cannot be called stellar parallax at all." Earlier in the Summer, Simon and I came up with this brilliant little experiment that, we are pretty certain, should prove or disprove the hypothesized speed of Earth predicted by the (as of yet undebunked) TYCHOS. Yes, in case you are late to the party, the Simontific method, which is based on the most simple and agreed-the-world-over standards of geometry, encounters so many unassailable points that even professional astronomers were scratching their head and learning from Simon their own science.
. . . 1. Earth rotates once on its own axis every 23hrs. 56min. Therefore, the TYCHOS speed for Earth is extremely likely if these parallax suppositions (7a. & 7b.) hold true. For better viewing and to minimize the effects of refraction, we will design an 8-hour test at USNO for these stars and compare the distance USNO is displaced laterally parallel with Earth's PVP orbit in 8 hrs vs. the same distance Earth moves the same distance. This percentage of 360 gives us our angle (at) of 120.33426 degrees. To determine the distance Earth repositions USNO laterally in an 8-hour period, we determine the chord of approx. 120.33426 degrees of Earth's plane intersection. 9,036.861396 km (minus 12.809352 km of daily travel) in Dec 21. 9,036.861396 km (plus 12.809352 km of daily travel) in Jun 21. To achieve the maximum parallel (and therefore maximum parallax) along the PVP, this time will follow exactly 4 hours either side of midnight (i.e. ; 8 pm to 4 am) on December 21st for star Procyon and June 21st for Vega. Earth viewing Procyon . . . 9,024.05 km in 5635.915 hours or 235.484 days. Earth viewing Vega . . . . . 9,049.67 km in 5651.915 hours or 236.152 days. Unfortunately, in an 8 month period (e.g. ; August 21 – April 21) you will not have perfect conditions to find parallax because the sun's brightness interferes with observations of the same stars. Therefore, the new experiment should be designed to operate within the confines of a roughly 4 month period within which parallax of Procyon and Vega may be observed and predicted. This should provide half of an 8-month period of data, and one could reasonably extrapolate twice the parallax. The reverse periods could be used for watching Vega's parallax.
. . . 5r. The USNO will rotate around a radial axis of approx. 5,209 km and displaces by roughly 9,037 km due purely to the rotation of Earth in 8 hours.
. . . . . . . a) The 117.742 day parallax for star Procyon viewed approx. Nov. 1 – Feb. 24 will reverse in a single 4-hr test from 10pm-2am December 21 of that period.
. . . . . . . b) The 118.076 day parallax for star Vega viewed approx. May 1 – Aug. 24 (estimate) will be replicated by a single 4-hr test from 10pm-2am June 21 of that period.
. . . . . . . c) Both of these will also hold true if 8-hr tests (8pm – 4am) on December 21 and June 21 are also performed and compared with parallax of 235.484 days (Procyon) and 236.152 days (Vega), provided the parallax data for those periods could be recorded. Therefore, the TYCHOS speed for Earth is extremely likely if parallax suppositions 7r(a,b,c) hold true. Voila! Perhaps one day a brave institution will wish to conduct such a test or provide the (unmodified raw) data for these periods and thereby bring a lot of attention to themselves. The TYCHOS experiment is flexible this way: it can be easily modified for any given location on a (quite round) planet and therefore any institution (especially on a parallax heavy latitude such as, oh I dunno, the equator, let's say) can afford to do it if they just spare the time. I cannot think of a more guaranteed potential for peaceful, equanimous media attention than disproving heliocentrism in the middle of the fanciful NASA/SpaceX era. hoi.polloi wrote: I cannot think of a more guaranteed potential for peaceful, equanimous media attention than disproving heliocentrism in the middle of the fanciful NASA/SpaceX era. Well said, dear Hoi - I couldn't have expressed it better myself!